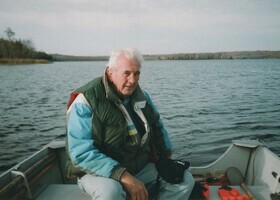 Provide comfort for the family of Norman Boulter with a meaningful gesture of sympathy. It is with great sadness we announce the passing of Norm Boulter, of Foxboro on Wednesday, April 10th, 2019 at the Belleville General Hospital in his 77th year. Son of the late Bernard & Clare Boulter. Much loved husband of 57 years to Sheila (nee Aman). Proud father of David Boulter (Sandra) of Belleville, Karen Boulter of RR#7 Belleville and Janet Lyons (Paul) of Stirling. Loving grandfather to Wesley, William, Sarah, Aaron, Cynthia, Amanda, Jason and great grandfather to Nora and Alice. Norm is also survived by his sister Barbara Drumm, his brother William Boulter and sister-in-law Marlene Boulter. Predeceased by sisters Una, Shirley, Eleanor and brothers Jack and Bernard. In keeping with Norm’s wishes cremation arrangements have been made with BELLEVILLE FUNERAL HOME & CHAPEL LTD. 68 N. Front St. Belleville (613-968-5080). There will be a graveside service held in the spring. If desired memorial donations to the War Amps are appreciated by the family. Graveside service will be held in the Spring. Donations are being accepted for: THE WAR AMPUTATIONS OF CANADA. Consider providing a gift of comfort for the family of Norman Boulter by sending flowers. We are so sorry to learn of Norms passing, it's been many years since we've been in touch but we have fond memories of Norm and the gang "on the bus" at Martins Park. It is with great sadness I send my love to Aunt Sheila & family. He used to say to all his nieces & nephews don’t tell but you are my favourite. I have to say he was my favourite. Loved his gentleness his opened heart to all & especially his snicker. He is missed already. Loved him muchly.